Unison Media launches The Crypt Sessions with Conrad Tao and Lawrence Brownlee. 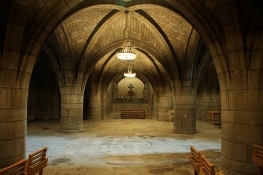 It's a new concert series featuring intimate performances in the crypt underneath the Church of the Intercession in Harlem, New York. Set in their extraordinary underground crypt, the series will feature some of classical music and opera's most exciting stars, in intimate performances tailored to the space. The concerts are the newest initiative in our mission to explore new and exciting ways to present and promote classical music. Twenty-one-year-old pianist/composer Conrad Tao will perform a wide-ranging set tailored to the space, including some music from his new album Pictures, his own compositions, as well as a few other surprises. Lawrence will take a break from the Metropolitan Opera stage, where he'll be singing Rossini's La Donna del Lago, and share an intimate set of spirituals with longtime collaborator and Harlem resident Damien Sneed. Friday, January 8, 1 p.m. and 7 p.m.
Saturday, January 9, 3 p.m.
Sunday, January 10, 3 p.m.
Saturday, January 16, 2016, 8 p.m.
Sunday, January 17, 2016, 2 p.m. and 5 p.m.
Wednesday, January 20, 2016, 7 p.m.
Saturday, January 23, 2016, 8 p.m.
Sunday, January 24, 2016, 7:30 p.m.
Monday, January 25, 2016, 7:30 p.m.
Tuesday, January 26, 2016, 7:30 p.m.
Thursday, January 28, 2016, 7:30 p.m.
Friday, January 29, 2016, 8 p.m.
Music of the Baroque (MOB) announced that internationally acclaimed lyric tenor Thomas Cooley will serve as Artist-in-Residence during the ensemble's upcoming 45th Anniversary Concert Season. Mr. Cooley appears with Music of the Baroque three times this season — in MOB's recent program of Bach cantatas; in the title role of Handel's Judas Maccabaeus in performances Thanksgiving weekend; and in April in the great 1610 Vespers of the Blessed Virgin by Claudio Monteverdi. During the season, he will also offer master classes for Chicago-area singers, work with students from Music of the Baroque's "Strong Voices" arts education program at partner Chicago public high schools, and present a spring vocal recital (program to be announced). 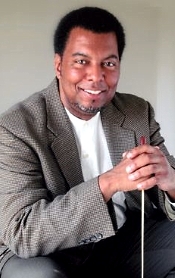 Mr. Cooley last sang with Music of the Baroque as tenor soloist in the Mozart Requiem in October 2014; he has also appeared with the ensemble in Handel's Acis and Galatea and L'Allegro, il Penseroso ed il Moderato. 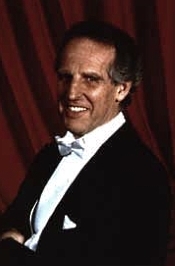 "Thomas Cooley as Acis commanded a formidable technical arsenal," wrote Opera News of the former, while Chicago Classical Review said of the latter, "Thomas Cooley proved a vividly characterful presence bringing great relish to his solo opportunities and pin-point clarity to his words." Music Director Joana Carneiro and Berkeley Symphony perform the U.S. premiere of Russian composer Sofia Gubaidulina's Fachwerk on Thursday, December 3 at 8 pm at Zellerbach Hall in Berkeley, with world-renowned Norwegian bayan pioneer Geir Draugsvoll in his Bay Area debut. Fachwerk was written for bayan (classical accordion), percussion, and strings. The evening opens with two brass works by Italian Renaissance composer Giovanni Gabrieli – Canzon septimi et octavi toni and Sonata pian e forte – and concludes with Mussorgsky's much-loved Pictures at an Exhibition. Geir Draugsvoll is considered to be one of the most important musicians on his instrument, the bayan. With a repertoire ranging from Bach, Mozart, Grieg and Stravinsky to modern composers including Gubaidulina, Hosokawa, Berio, Nørgaard, and Piazzolla, he has performed all over Europe, and also toured China and Japan. He has performed with orchestras and ensembles including the London Symphony Orchestra, Mariinsky Orchestra, Russian National Orchestra, the Netherlands Symphony Orchestra, Kremerata Baltica, Moscow Soloists, and the Norwegian Radio Symphony Orchestra. Draugsvoll collaborates with many composers, and premiered a large number of their works, including Gubaidulina's Fachwerk, which is dedicated to him. He recorded the work with the Trondheim Symphony Orchestra for release on Naxos. Draugsvoll is a professor at Copenhagen's Royal Academy of Music. Tickets: $15-$74. Tickets to all of Berkeley Symphony's 2015-2016 concerts are on sale now at www.berkeleysymphony.org; by phone at (510) 841-2800, ext. 1; by fax to (510) 841-5422; or by mail at 1942 University Avenue, Suite 207, Berkeley, CA 94704. Berkeley Symphony offers a $7 Student Rush ticket one hour prior to each performance for those with a valid student ID. Philharmonia Baroque Orchestra and KDFC are pleased to present PBO SESSIONS: The Royal Brandenburgs, on November 9th at ODC Theater. PBO (Philhrmonia Baroque Orchestra) has quickly gained success with its alternative format concert series and, after public demand, will present its next installment, The Royal Brandenburgs. This upcoming "session"will feature acclaimed conductor and harpsichordist, Richard Egarr, who will present Bach's Brandenburg Concertos in an entirely new and enlightening way. Since its inception in 2014, SESSIONS has played to sold-out audiences captivated by its refreshing, innovative, and short format.These 90-minute concerts are designed to take audiences on a guided tour of classical music in informal settings, complete with multimedia presentations and dynamic dialogue from the stage. PBO SESSIONS concerts are led by Music Director Nicholas McGegan or guest conductors sharing anecdotes about the composers, the pieces, the period in which the music was created, and how the music is still relevant today. The audience is treated to musical demonstrations in historical context that deepens understanding of classical music in a relaxed and fun atmosphere. Following the concerts, free wine and mingling with musicians is always available. PBO SESSIONS: The Royal Brandenburgs will be hosted by KDFC's Hoyt Smith and plans to explore J.S. Bach's Brandenburg Concertos 3, 4 and 5. Richard Egarr, from the Academy of Ancient Music, will perform, demonstrate and share his deep knowledge of these works with a multimedia presentation and exquisite performances by members of Philharmonia. The concert takes place at the intimate brick-walled ODC Theater in San Francisco's Mission District on Monday, November 9 at 8 p.m. General admission tickets are $25 and include the post-concert reception with complimentary wine and access to Egarr and the musicians. More information and tickets at philharmonia.org/pbo-sessions or call 415-295-1900. Performing for the first time in his home state of Florida and on the Festival Miami stage, multi Grammy and Emmy Award-winning performer John Easterlin, B.M. '84, was named the 2015 University of Miami Phillip and Patricia Frost School of Music Distinguished Alumnus. Easterlin was honored during his October 24 Festival Miami concert, "What a Character! The Many Faces of John Easterlin." A Miami native, Easterlin travels the world to perform in major venues and productions. One of international opera's most compelling artists, he has turned 2015 into his year of debuts, performing for the first time at the Phoenicia Festival of the Voice, with the Palm Beach Opera in their new production of Ariadne auf Naxos, and with the Nashville Opera in Die Fledermaus. During his Festival Miami performance, Easterlin thrilled Festival Miami concert goers with a variety of Broadway, gospel, folk, operetta, and opera favorites. New York-based pianist Mitchell Cirker accompanied Easterlin throughout the evening's concert. Shelly Berg, dean of the Frost School of Music, appeared as a special guest on piano and also presented Easterlin with the Distinguished Alumnus plaque during the show. Easterlin traces his singing success to the early 1980s, when he performed with the UM Chamber Singers under the direction of late music professor Lee "Doc" Kjelson. Easterlin has appeared on PBS's Great Performances and Live from Lincoln Center, as well as a telecast, CD, and DVD of Los Angeles Opera's acclaimed production of Kurt Weill's The Rise and Fall of the City of Mahagonny, for which he received 2008 Emmy and Peabody Awards and two 2009 Grammy Awards for Opera Recording of the Year and Classical Album of the Year. 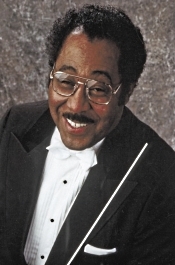 Throughout his career, Easterlin has worked with famous conductors including Daniel Barenboim, Seiji Ozawa, Sir Andrew Davis, Antonio Pappano, James Conlon, Valery Gergiev, and Dennis Russell Davies, and eminent stage directors like Diane Paulus, Richard Jones, Phelim McDermott, Francesca Zambello, and Robert Wilson. Camilla Tilling, soprano; Benjamin Zander, Philharmonia Orchestra. Telarc 2CD-80555 (2-CD set). As with his other recordings of Mahler for Telarc, like the Fifth and the Ninth Symphonies, especially, Benjamin Zander's interpretation of the Fourth is probably as close to the score and to Mahler's intentions as the conductor says he could get. This doesn't necessarily make for the most ravishing, insightful, or engaging performance on record, but it does help clarify some of Mahler's mood swings, and it does produce a reasonably good recording. Listeners have generally found the Fourth among Mahler's most accessible symphonies, and the composer intended it so. For one thing, it's short. In Mahlerian terms that means a little under an hour. More important, it maintains a positive, often cheerful, ultimately spiritual mood throughout. No funeral dirges here. Oddly, the booklet note by Michael Steinberg points out it wasn't always so. The first audiences to hear the Fourth Symphony found it disappointing, thinking it passive and undemanding. They expected more of a storm from the composer. Well, times change and people now love the Fourth as I'm sure Mahler expected them to. Maestro Zander's performance does sound a bit underwhelming compared to others I had on hand, however, like those from Szell (Sony or HDTT), Klemperer (EMI/Warner), and even the usually reserved Haitink (Philips). Still and all, the Zander reading appears to do everything it should, particularly in the enchanting third movement Adagio, one of Mahler's most serenely beautiful pieces of music, made ever more charming under the conductor's watchful guidance. Nevertheless, here's the thing: For me, Camilla Tilling's singing in the final movement sounds a bit earthbound. It's adequate, to be sure, just not quite the innocent and heavenly entrance into heaven we have heard before. Anyway, that minor interpretive quibble aside, Telarc's sound is also excellent, a good combination of hall ambiance and inner detail. It is, in fact, one of Telarc's best: very dynamic, with a really solid low end. By comparison, though, the old Szell recording on Sony sounds good, and remastered by HDTT it sounds terrific. What's more, Haitink's second Concertgebouw recording on Philips is positively radiant. The Klemperer sounded a bit thin and bright alongside the Telarc release, but it was not at all unpleasant. Be that as it may, with the Philharmonia Orchestra playing so well and sounding so luxurious, it's hard not to like the Telarc offering. 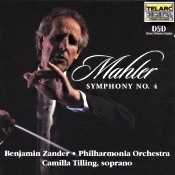 As with Telarc's other Mahler recordings with Zander, the company provides a second disc accompanying the symphony whereon Zander takes us step by step through the four movements, explaining why he interpreted things the way he did. He uses additional recorded material from other labels by way of illustrating his points, a concept I liked. It reminded me of the audio commentaries on so many DVD and Blu-ray movies where the filmmakers discuss each scene. Zander tends to appear a tad pompous at times with his overly precise diction, but his ideas make sense, and he seems to be a remarkably knowledgeable individual. In any case, the second disc is a freebie, so take it or leave it. Anne Akiko Meyers, violin; Keith Lockhart, London Symphony Orchestra. eOne EOM-CD 7792. Having already reviewed three of American concert violinist Anne Akiko Meyers's numerous record albums helped prepare me for what she gives us here. Certainly, two of the most salient features of Ms. Meyers's playing are her sensitivity and delicacy of touch, so it came as no surprise when she released the present program of romantic tunes, aptly labeled Serenade: The Love Album. It is as lovely as you would expect it to be. According to my Harvard Concise Dictionary of Music, a serenade in the 18th century was "originally a vocal or instrumental piece performed outdoors in the evening for the benefit of some particular listener. As a title for instrumental works of the period, the term was closely related to cassation, notturno, and divertimento. It may apply to lighter multi-movement works in a variety of scorings, including mixed strings and winds, often intended for soloistic as opposed to orchestral performance." Ms. Meyers's album concentrates on twentieth-century serenades, starting with the five-movement work titled Serenade by Leonard Bernstein, followed by a number of other pieces newly arranged for the violinist and orchestra. On the present recording, Ms. Meyers plays the 1741 "Ex-Vieuxtemps" Guarneri del Gesu violin, considered one of the finest-sounding violins in the world, with Maestro Keith Lockhart and the London Symphony most ably accompanying her. 8. George Gershwin: "Someone to Watch Over Me"
14. Leigh Harline: "Wish Upon a Star"
15. Sammy Fain: "I'll Be Seeing You"
Bernstein based Symposium on Plato's work of the same name, where seven ancient Greek philosophers debate the meaning of love. It's typically Bernstein with one foot in the classical world and the other firmly on Broadway. Under Ms. Meyer's responsive control it sounds alternately tender, lyrical, and dramatic. I'm still not too keen on all of the music, but Ms. Meyers gives it full measure, her obvious virtuosity, meticulous attention to detail, and scrupulous subtlety winning the day. The popular tunes (in their new, world-premiere arrangements) worked best for me, probably because I'm a Philistine, I don't know. Ms. Meyers shows a wonderful affinity for each of the melodies, gracing each line with joy and love. What's more, Maestro Lockhart and the LSO provide her with as sweet an accompaniment as one could hope for. The entire album comes across as a single love song, the selections gently flowing into one another as a unified whole. If I had to make a choice of favorites, though, I'd probably pick the two Gershwin numbers for their maturity, strength, and innovation. Nevertheless, it would be hard to make such a choice, and who could not like "I'll Be Seeing You"? Drawbacks? Well, I suppose some listeners might find the whole thing a bit too sentimental for their taste. They wouldn't be wrong, of course; love songs can be--indeed, one can make the argument that they should be--sentimental. My reaction to such criticism would be, So what? These tunes are what they are, frankly emotional, and that's the way Ms. Meyers plays them, although not in an hokey fashion. Really, it's a lovely program. Producer Susan Napodano DelGiorno and engineer Silas Brown recorded the music for Entertainment One at LSO St. Luke's, London, in February 2015. The soloist sounds well placed, not too far forward, the violin tone warm yet detailed. The orchestral accompaniment is likewise natural and dimensional, with a realistic sense of air and depth. The sound is lifelike and easy on the ear. Also, Rachmaninov: Piano Concerto No. 4. Arturo Benedetti Michelangeli, piano; Ettore Gracis, Philharmonia Orchestra. Warner Classics 0724356723825. Face it: Italian concert pianist Arturo Benedetti Michelangeli (1920-1995) must have had a hard time finding material that sounded as good as his name. Seriously, for one of the greatest pianists of the twentieth century, he left behind relatively few recordings. This was not, however, for lack of trying. It's just that the man was a perfectionist and didn't approve the release of many of the recordings he made. 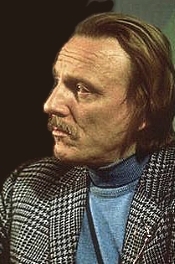 No matter: The ones he did leave us are enough to ensure that Michelangeli's name will live on for a very long time. 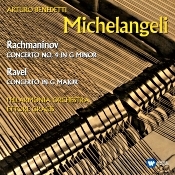 No doubt, one of the best things Michelangeli ever did was this recording of Ravel's and Rachmaninov's Piano Concertos. Especially the Ravel. In my mind and having heard a whole lot of them, Michelangeli's Ravel interpretation reigns supreme. It was 1931 when French composer Maurice Ravel (1875-1937) wrote the Piano Concerto in G major, a clear result of George Gershwin's music having persuaded him to inject some American jazz into his music. This connection is evident early on in the concerto, but, as we might have expected, Ravel added his own suggestions of dreamy, Romantic impressionism to the mix. It's certainly one of Ravel's most-imaginative works, full of jazzy bustle one moment and the tenderest grace the next, and unless the pianist is careful, the piece can appear as merely a series of clamorous rants and dreamy allusions. In Michelangeli's hands, the music is magical. Yes, as I say, under Michelangeli, everything seems just right. He rushes nothing, a common failing in too many other performances of this work, instead gracing each note with a perfect timing. The result is almost mystical, the jazz elements present, to be sure, yet never with any overemphasis. What can seem merely hustle and bustle in some interpretations here sound exactly right, the transitions so effortless that the whole piece appears as one. Michelangeli never grandstands, every note unforced and effortlessly effective. And yet those long solo passages seem to grow organically from the ground up, the performer creating excitement in a fluid, flowing manner. With Michelangeli, the Adagio is practically hypnotic and casts a haunting spell over the entire piece. It's meltingly beautiful. Then we get a finale that sounds every bit as insightful and daring as the movements that went before it, filled with extreme but still graceful intensity and virtuosic playing. Russian composer, pianist, and conductor Sergei Rachmaninov (1873-1943) wrote his Piano Concerto No. 4 in G minor in 1926, but it would be a couple of more years before he felt it ready for publication. While today it rather takes a backseat to the more popular Second and Third Concertos, it still exhibits its own merits. In fact, if the overt Romanticism of those previous concertos bother you, the Fourth may be just down your alley. Like the Ravel work, the Rachmaninov piece displays some influences of Gershwin-like jazz, just not quite as much. Although the Rachmaninov concerto sounds more dramatically inclined that the Ravel, Michelangeli plays up its more-lyrical side with equal agility, letting the eagerness of the moment take care of itself. It's a kind of self-effacing performance from the pianist, one in which he fades into the music itself instead of standing out as its supreme commander. Then, as the icing on this most-delectable cake, the orchestra blends into the proceedings almost subliminally. Pianist and orchestra are so at one you can hardly tell these works are concertos at all. Meaning Maestro Gracis is with Michelangeli all the way, from the most-hushed interludes to the biggest crescendos. This is, indeed, an album for the ages. Producer Peter Andry and engineer Christopher Parker recorded the two concertos at Studio No. 1, Abbey Road, London in March 1957. The Warner Music Group reissued it in 2015, but if you were expecting a new remaster, it didn't happen. This is the same mastering EMI made in 2000 for their "Great Recordings of the Century" series. If you already own that one, you have no need for this one. On the other hand, if you don't already have this recording, the sound holds up extremely well, and you'll not find better performances. The sound, in fact, is very transparent, with a wonderful sense of dimensionality and air. What's more, there is a wide dynamic range involved, with reasonably good impact on the stronger transients. The instruments blend well, yet individual instruments stand out as well, without appearing too multi-miked. The piano itself feels well placed, slightly ahead of the orchestra but not too far. It also sounds clear and natural, with just a touch of realistic room ambience to heighten the illusion of being there. Maybe because the orchestration in the Rachmaninov is a bit more lavish, the sound there is a tad warmer. The Young Artists Orchestra received an overwhelming amount of praise from their inaugural performance on Sunday, October 18. Hal Weller, the founder of the Las Vegas Philharmonic and founder of FAYM, described the concert as "the highest level performance by a young orchestra I've heard in many years." The Orion Ensemble, winner of the prestigious Chamber Music America/ASCAP Award for Adventurous Programming, welcomes guest harp virtuoso Ben Melsky, a member of the highly acclaimed Ensemble Dal Niente and principal harpist for the Joffrey Ballet and Ann Arbor Symphony, for his Orion debut on a program of 20th century music, "Harp Fantasy." Performances take place at First Baptist Church of Geneva November 22; the Music Institute of Chicago's Nichols Concert Hall in Evanston November 29; and the PianoForte Studios in downtown Chicago December 2. Orion's 2015-16 season, Fantasies and Enchantments, continues with "American Landscape" in March, with music by Berkey, Sowash and Dvorák, and "Musical Enchantments" in May and June, with guest violinist Mathias Tacke and guest violist Stephen Boe performing works by Dvorák, Beach and Brahms. Also during the season, Orion appears on the broadcast series "Live from WFMT" March 28, 2016 at 8 p.m. The Orion Ensemble's concert program "Harp Fantasy" takes place Sunday, November 22 at 7 p.m. at First Baptist Church of Geneva, 2300 South Street in Geneva, IL; Sunday, November 29 at 7:30 p.m. at Music Institute of Chicago's Nichols Concert Hall, 1490 Chicago Avenue in Evanston, IL; and Wednesday, December 2 at 7:30 p.m. at the Pianoforte Studios, 1335 S. Michigan Avenue in Chicago, IL. Single tickets are $26, $23 for seniors and $10 for students; admission is free for children 12 and younger. A four-ticket flexible subscription provides a 10 percent savings on full-priced tickets. In 2016 and 2017, conductor Michael Christie will lead world premiere productions of two boundary-breaking operas based on modern culture. At the Minnesota Opera, where Christie is Music Director, he will conduct the world premiere performances of The Shining, an opera composed by Pulitzer Prize-winning composer Paul Moravec with libretto by Mark Campbell, based on the novel by Stephen King. The world premiere of The Shining kicks off the second phase of the Minnesota Opera's New Works Initiative, which will include the world premiere of Dinner at Eight by William Bolcom, a performance of Cold Mountain by Jennifer Higdon, plus remaining commissions yet to be announced. The first phase of the New Works Initiative was a seven-year effort to commission and revive new and important American Opera. Christie recently led world premiere performances of composer Kevin Puts and librettist Mark Campbell's Pulitzer Prize-winning opera Silent Night as well as The Manchurian Candidate. For each commission, Christie is actively involved with the operas' creative teams from beginning to end, including extensive workshopping supported by the New Works Initiative. In 2017, Christie will lead the much-anticipated world premiere performances of The (R)evolution of Steve Jobs by Mason Bates and librettist Mark Campbell with The Santa Fe Opera. Recently named the second most-performed living composer, Bates currently serves as the first composer-in-residence of the Kennedy Center for the Performing Arts and this will be his first produced opera. The (R)evolution of Steve Jobs examines the life of one of the most fascinating figures of our time and seeks to capture the buzzing creativity of Silicon Valley. The opera received its first workshop treatment in San Francisco in September 2015 and was shared with a small audience at San Francisco Conservatory of Music in collaboration with Cal Performances at UC Berkeley. The California Symphony and Music Director Donato Cabrera join with the acclaimed, Grammy Award-winning Pacific Boychoir for three holiday concerts December 21-23 at the Lesher Center for the Arts in Walnut Creek, CA, and at the orchestra's first performance at the Napa Valley Performing Arts Center's Lincoln Theater in Yountville, CA. A highlight of the holiday "Traditions New and Old" program is the animated family film The Snowman on the big screen, with the score performed live by the orchestra. The music also includes selections from Tchaikovsky's Nutcracker Suite, Anderson's "Sleigh Ride," and other festive holiday favorites, including songs and carols for the audience to sing along. The orchestra performs the "Traditions New and Old" holiday program at the Lincoln Theater in Yountville on Monday, December 21 and at the Lesher Center for the Arts in Walnut Creek Tuesday, December 22 and Wednesday, December 23. All concerts are at 7:30 pm. Tickets for the California Symphony's "Traditions New and Old" concert at the Lesher Center for the Arts in Walnut Creek are $42 to $72, and can be purchased through the California Symphony's website at www.californiasymphony.org and at 925-943-7469. Tickets for the Lincoln Theater concert at Yountville's Napa Valley Performing Arts Center are $35 to $70 and can be purchased by calling 707-944-9900 or visiting www.lincolntheater.com. The Israel Philharmonic Orchestra, joined by Music Director for Life Zubin Mehta, returns to the United States in November 2015 for an eight-city tour, with performances taking place in New York, Los Angeles, Chicago, San Francisco, San Diego, Dallas, Cleveland and Palm Desert, CA. The American Friends of the Israel Philharmonic Orchestra (AFIPO) will present gala benefits in five of these cities, as they celebrate their 35th Anniversary supporting and broadening the Orchestra's activities and artistic vision. Since its founding, the Israel Philharmonic Orchestra has maintained a strong bond with its American supporters. The non-profit organization American Friends of the Israel Philharmonic Orchestra (AFIPO) was created in 1980 to formalize and broaden the relationship between North America and the Israel Philharmonic Orchestra with continuing the tradition of giving. In addition to generating an endowment and increasing the reach of the Orchestra through financial support of national and international tours, AFIPO was also instrumental in developing KeyNote, the educational arm of the IPO. Founded in 2000, KeyNote programs bring the joy of classical music to over 29,000 children in Israel each year, while promoting tolerance and mutual respect. AFIPO seeks to strengthen the reach of the IPO as the preeminent cultural ambassador for the State of Israel and expand the support of classical music and musical education in Israel. Virtuoso concert organist Stephen Jon Hamilton performs on Sacred Music in a Sacred Space's 2015-2016 N.P. Mander Organ Recital Series, November 15th at 3pm at New York City's Church of St. Ignatius Loyola. Organist Stephen Jon Hamilton has long been prominent on the American organ scene. For the past thirty years, Hamilton has earned critical acclaim as a thoroughly engaging and popular artist and has firmly established his reputation as a leading and much sought-after personality. Stephen Jon Hamilton performs the second recital in the four-part N.P. Mander Organ Recital Series on November 15, 2015, at 3:00 pm. The New York Times wrote of a performance of the Bach Passacaglia and Fugue in C Minor: "Hamilton … obviously knew the instrument's sonorous capabilities and brought them powerfully to bear in a rousing account." The Charleston Daily Mail reviewed: "This performance had to be one of the supreme moments of music making in this year's or any other year's Orgelfest offerings." And the St. Petersburg Independent said, "Performing a most taxing program with ease, here was a serious, thorough, competent, and well disciplined musician who played with authority and poise." Here's your opportunity to hear the best and brightest young musicians in the country as Nicholas McGegan and Philharmonia Baroque Orchestra join Juilliard415 at this very special side-by-side concert. Juilliard415 is the Juilliard School's student Baroque ensemble. These brilliant students represent the future of Baroque music in America and this is your chance to spot the talent early. Don't miss this rare collaboration between the nation's leading period-instrument orchestra and the Juilliard School. When: Sunday, November 22 at 4 p.m.
Augustin Hadelich is the winner of the inaugural Warner Music Prize, it was announced today in New York City. The prize, a new classical music award established by the Warner Music Group, is to be given annually to a musician under the age of 35 who demonstrates exceptional talent and promise. The winner, chosen from a pool of 16 artists, is selected by a jury of world-renowned classical musicians and music industry leaders. The award includes a $100,000 cash prize and an opportunity to make a recording for Warner Classics. The prize is also supported by the Blavatnik Family Foundation, which supports classical music and cultural projects. Nominees for the inaugural 2015 Warner Music Prize were drawn from young singers and instrumentalists presented by Carnegie Hall in significant solo roles during the 2014-15 concert season. Augustin has appeared on the stages of Carnegie Hall numerous times, most recently in December 2014 performing Barber's Violin Concerto in Stern Auditorium with the New York String Orchestra. Prior to that, in April 2014 in Zankel Hall, he gave the world-premiere performance of mystery sonatas by David Lang, a work commissioned by Carnegie Hall. "I cannot imagine a better performance than the one Mr. Hadelich gave," enthused The New York Times's Anthony Tommasini. "His playing combined impressive technical command with plush, rich-textured sound. And with magisterial poise and serene control, Mr. Hadelich became a riveting storyteller." Augustin will return to Stern Auditorium in December 2015 when he makes his debut with the Orpheus Chamber Orchestra. Boston Baroque 2015-16 season features music of Vivaldi, Beethoven, Haydn, Handel, and Mozart. The season launched on October 23rd with Vivaldi's only surviving oratorio, Juditha Triumphans. The concerts are presented at the New England Conservatory's Jordan Hall and Harvard's Sanders Theatre. 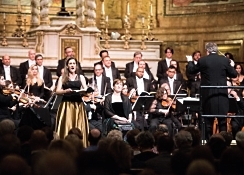 Boston Baroque's 2015-2016 season launched October 23 with Vivaldi's Juditha Triumphans. This fine Italian Baroque oratorio – Vivaldi's only surviving work in the genre – is part of a season which also includes Handel's Messiah, Beethoven's Piano Concerto No. 2 with Fortepianist Kristian Bezuidenhout and Mozart's Die Zauberflöte (The Magic Flute) starring Nicholas Phan. "For the 2015–2016 season, Boston Baroque continues its commitment to presenting today's leading performers, alongside our Grammy-nominated orchestra and chorus. To kick off the season, we present Vivaldi's masterpiece oratorio Juditha Triumphans, featuring the Boston Baroque debut and the Boston debut of mezzo-soprano Daniela Mack, a finalist in the 2013 BBC Cardiff Singer of the World Competition," notes Boston Baroque founder and music director Martin Pearlman. Music Institute of Chicago alumna Kate Liu has placed third—the highest-placing American—in the 17th Fryderyk Chopin International Piano Competition, in yet another example of the extraordinary accomplishments of students from the Music Institute's Academy for gifted pre-college musicians, celebrating its 10th anniversary this year. Kate Liu, 21 years old, is from Winnetka, Illinois and attended New Trier High School. She studied at the Music Institute beginning in 2004 with the late Emilio del Rosario, then with Micah Yui and Alan Chow. She now studies with Robert McDonald at the Curtis Institute of Music. She was a member of the inaugural class of the Academy, a program that has consistently produced top performing classical musicians like violinist Ben Beilman, violist Matthew Lipman and cellist Gabriel Cabezas. Her prize is 20,000 euros and a bronze medal, funded by the President of the Council of Ministers. Alan Chow, piano faculty at Northwestern University and the Music Institute Academy, commented, "Kate is an absolute joy to know and to teach... What sets her apart from other pianists of her generation are perhaps two things: first, her intensely personal desire to know more, to search for meaning and answers in her music—she is always thinking and is never easily satisfied. Second, it's her ability to express and communicate her emotions fully and completely in performance—she's 'in the moment' on stage. And when she performs, it's completely honest—no affectations of any kind. I think this combination of qualities is quite rare in someone her age. She is clearly on the verge of a wonderful performing career!" "Persecution and Promise: A Legacy of Czech Music"
Also, The Oceans; The Culprit Fay. John McLaughlin Williams, National Symphony Orchestra of Ukraine. Naxos 8.559064. 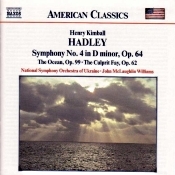 According to a Naxos booklet note, in 1933 the Musical Courier called American Romantic composer John Kimball Hadley (1871-1937), "probably the most important composer in the contemporary American musical scene." Hadley wrote five symphonies, numerous choral, piano, and operatic works, toured the world with various orchestras, and founded the Berkshire Music Festival. Such is the fleeting nature of fame, however, that by 2001 the folks at Naxos were about the only ones left to revive his music in their "American Classics" series of low-cost recordings. The opening piece on the album is a tone poem called "The Ocean," written in 1920. It jumps right into the fray with a long, tempestuous passage expressive of a raging sea. The waters finally calm to a ripple, only to explode later into greater fury and then settle down once more. The musical expression here is reminiscent partly of the evocations of Claude Debussy and partly of English composer Arnold Bax; "Tintagel" comes to mind. The second piece on the disc is another tone poem, this one called "The Culprit Fay," 1908, based on a popular nineteenth-century poem. The music is about a fairy who loves a mortal maid, and the author apparently wrote it to celebrate the Hudson River. So, that's what Hadley's music does, too. This selection is more playful than "The Ocean," a little silly, to be sure, yet its shimmering luminosity can sometimes sound beguiling. Still, it's not the most formidable of music. The main work on the disc is the Symphony No. 4, first performed in 1911, and representing with its four movements four moods, suggestive of the frozen North, the East, Southern ragtime, and the spirit of the West Coast. The beginning of "North" reminded me to a small extent of Ralph Vaughan Williams's Sinfonia Antarctica; the "East," to be a tad cynical, reminded me somewhat of the way Nicolai Rimsky-Korsakov might have treated The Song of Hiawatha; the section titled "South" is very Scott Joplin-like; and "West" sounds like something later Hollywood cinema might have adopted. Program notes by Hadley himself complement the arrangements, although they may not help much to make a person appreciate the music, which seems to me too derivative of other, better things. The performances of Grammy award-winning conductor John McLaughlin Williams and the National Symphony Orchestra of Ukraine probably do as much justice to the music as one might expect. As I had never heard the works before and had no comparisons to make, I can only say that Maestro Williams seems to communicate what the music demands of him and his players, making it as appropriately colorful and fun as possible. At the same time, it's hard to tell with music as undemanding as this. The sonics Naxos provided for Williams and the Ukraine Orchestra are not exactly what I'd call transparent, but they do sound warmly detailed and reproduce a reasonably good stage depth, a solid dynamic impact, and a fairly wide frequency range. It's pretty nondescript sound, actually, not bad but not great, either. In all, this is a reasonably enjoyable collection of highly accessible though probably justifiably forgotten orchestral music that listeners can hear for themselves for relatively little cost. Rachel Barton Pine, viola d'amore; Ars Antigua. Cedille CDR 90000 159. The viola d'amore is an odd instrument. It's an odd instrument today and it was an odd instrument in Vivaldi's day. 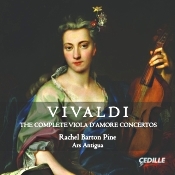 But Vivaldi was apparently so enamored of the instrument that he wrote eight concertos for it, all of which Rachel Barton Pine plays on the present recording, accompanied by Ars Antigua. How unusual is the viola d'amore? Usually, it's a special twelve-string viola, played under the chin in the same way as a violin, the performer utilizing six of the strings while the other six, located just below the first six, resonant sympathetically. The instrument produces a rich sound with, as the accompanying booklet tells us, "a shimmering, halo-like tone." Ms. Pine tells us that when she was a teenager the instrument fascinated her, but she really fell in love with it when she had the opportunity to acquire an original-condition, 1774 Nicola Gagliano twelve-string viola d'amore, coincidentally, the top of which she says "was made from the very same tree as the top of my original-condition 1770 Nicola Gagliano violin." Ms. Pine plays the eight Vivaldi Concerti d'Amore on the aforementioned historical viola, and Ars Antigua ("Ancient Art") attend her on period instruments. On the final concerto (Concerto in D minor, RV540), Hopkinson Smith joins Ms. Pine and the ensemble on lute. Now, if the sound and playing style of a period band concern you, have no fear. They may play in a lively vein with historical accuracy in the forefront, yet they are not a helter-skelter, hell-bent-for-leather group determined to produce the fastest-paced Vivaldi on record. These are charming performances, with musical enjoyment always the primary focus. No, there is no worry about Ms. Pine or Ars Antigua running through the concertos too fast. If you are one of Ms. Pine's fans, you know that her manner of playing is always warm and smiling. Yet she is never lax; the outer movements are usually allegros, and she ensures that they sound full of energy and excitement. Just not at a breathless pace. Moreover, Ms. Pine and company imbue the concertos with enough nuance that they seldom sound the same one to another, which with Vivaldi can be an accomplishment. OK, I admit that I probably wouldn't be able to identify any of these pieces by number the next time I heard them; still, while a person is listening to them, they all take on an admirably different character, thanks mostly to variations in the way Ms. Pine plays them. Anyway, the real question is whether you would be able to tell the difference in the sound of the viola d'amore and a period violin. I think most listeners familiar with a violin could tell. The viola d'amore has a slightly richer, more resonant, more airy sound than a violin. So, what we get here is a virtuoso violinist playing an instrument that more than ever shows off her talents. The player and instrument make beautiful music together. The Concerto in F major, RV 97 is the sole work in the set that begins slowly, with a wind accompaniment, the full ensemble returning for the finale. It's unusual, to be sure, and quite delightful. The Concerto in A minor, RV 397 is the only work that has the feeling of Vivaldi's Four Seasons, so the listener need have little worry about that matter. On the final concerto, RV 540, Hopkinson Smith accompanies Ms. Pine on lute. The lute adds a lovely, sensitive contribution to the program, the set going out on a real high note, musically. Each concerto is around ten minutes long, so because there are eight of them, Cedille have filled out the disc almost to the limit with over seventy-nine minutes of material. You can't say you're not getting your money's worth with so much music, so well played, and so well recorded. Cedille producer James Ginsburg and ace engineer Bill Maylone recorded the concertos at Nichols Hall at the Music Institute of Chicago in November 2011 and July-August 2014. The sound is remarkably transparent: coherent as an ensemble yet with almost every instrument clearly defined. A light ambient glow highlights the proceedings as well, giving the recording an extremely lifelike feel. The soloist appears well placed among the other players, never too far forward, and the ensemble has a strong dimensional feel without being too wide or too narrow across the sound stage. The frequency response seems quite wide as well, with a welcome sparkle at the high end; and dynamics seem equally wide, so the whole thing comes off like a live performance in your living room. 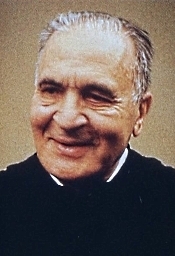 Bruno Walter, Columbia Symphony Orchestra. HDTT (remastered). The German-born conductor, pianist, and composer Bruno Walter made most of his late-career stereo recordings for Columbia Records and the Columbia Symphony Orchestra. It was not the best orchestra in the country because despite its membership consisting mainly of freelance musicians and members of the New York or Los Angeles Philharmonic (depending on where Columbia was recording them), it really only played together for recording purposes. Nevertheless, Walter made some of his best music with them, including the Brahms symphonies, Beethoven, Bruckner, Mahler, Mozart, and Wagner. 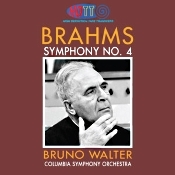 This Brahms Fourth Symphony, which Walter recorded in 1959, concluded his Brahms cycle on a high note, and HDTT (High Definition Tape Transfers) do a fine job remastering it. Interestingly, the composers I mentioned above were also among those that one of Walter's contemporaries, conductor Otto Klemperer, also excelled at doing. I've often wondered if it was just because both men were born in Germany around the same time and so had an affinity for the work of German and Austrian composers, or whether it was because both men in their younger days worked closely with composer Gustav Mahler. Maybe a little of both? Whatever the case, Walter and Klemperer produced excellent sets of Brahms recordings. Johannes Brahms (1833-1897) premiered his Symphony No. 4 in E minor, Op. 98 in 1885, and it is one of the most wholly satisfying symphonies of his four. The opening movement begins gracefully and builds in dramatic tension using some of the composer's most memorable tunes. How a listener reacts to Walter's approach to the symphony will probably come quickly into the opening movement. A booklet note tells us that he had also recorded the Brahms cycle about a decade earlier (in monaural, of course) in performances that had "a lean, crisp sound." This time it's a little different. If you're looking for a big, dramatic reading, you're probably better off with conductors such as Klemperer, Bernstein, Kleiber, and the like. Walter, on the other hand, is relatively light and lyrical. He isn't slow by any means, just gentle and flowing and always with an unerring forward momentum. Nor does Walter's performance lack in weightiness or authority. It's simply a lovely, rich, sort of autumnal interpretation. The second movement is placid, serene, wearing its heart on its sleeve, so to speak, accompanied by a plush orchestral arrangement. Walter takes this slow movement at a relaxed pace, making it among the most-peaceful renderings ever recorded. It's a perfect follow-up to the calm, unhurried tack he took in the first movement. The third movement Scherzo is cheerful, festive, and exuberant. It provides the symphony a sudden note of excitement and happiness, and Walter uses it to advantage to help balance the more tranquil moments. The Finale is powerful and relatively serious. Here, you'll find Walter concluding on a strong note, emphasizing the powerful architecture of the symphony. There is nothing showy or extroverted about the performance, yet the positive thrust of the music is always paramount. Yes, you'll find more excitement in other recordings of this symphony. However, you'll not find more heart or soul than with Walter. This is as loving an interpretation as any you'll hear. Producer John McClure made the recording for Columbia Records (CBS, Sony) in Los Angeles, February 1959, and HDTT remastered and transferred it to compact disc from a Columbia 4-track tape. The sound is some of the best Columbia provided in the Fifties and Sixties, and it comes up well in HDTT's transfer. It's very clean and clear, with a nice sense of dimensionality, left-to-right stereo spread and front-to-back depth. There is a hint of hard forwardness to the upper midrange, it's true, but it tends to reinforce the recording's transparency and should not be at all bothersome except perhaps to the most finicky of audiophiles. There is also a reasonably good dynamic range and a modest degree of hall resonance. This is not your old-time Columbia sound. Sacred Music in a Sacred Space's Choral Concert Series Opens with Bernstein's Chichester Psalms featuring countertenors Eric S. Brenner and Timothy Parsons. October 28 at 7pm at New York City's Church of St. Ignatius Loyola. 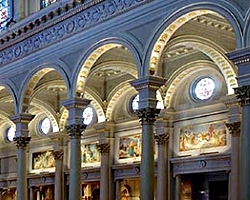 The venerable concert series Sacred Music in a Sacred Space (SMSS) in its home at New York City's visually arresting Church of St. Ignatius Loyola, has delighted and inspired audiences for 27 years. The SMSS concert series continues to serve as one of the leading cultural institutions in New York City for sacred classical music, attracting New York City's finest musical talent for exhilarating performances. SMSS' 2015-2016 season theme Choral America represents an offering of works as diverse as the nation itself. Encompassing many musical forms and styles—from the European classical tradition to Appalachian folk songs, spirituals, jazz and blues—the Choir and Orchestra of St. Ignatius Loyola over three Choral Concerts pay homage to some of America's most treasured composers. The 2015-2016 Choral Concerts begin on Wednesday, October 28, 2015, at 7pm with a quartet of American works for choir and orchestra by three of America's most revered choral composers. The Choir and Orchestra of St. Ignatius Loyola under the direction of K. Scott Warren are joined by countertenors Eric S. Brenner and Timothy Parsons. The Music Institute of Chicago, a community music school dedicated to transforming lives through music education, announced that Angela Lee, Wilmette resident and a junior at New Trier High School, is the first recipient of the Hurtado Scholarship. Lee is a cello student of Music Institute faculty member Gilda Barston. The Music Institute will award the Hurtado Scholarship, which covers one year of tuition, annually to a Music Institute student who demonstrates a high degree of accomplishment in music and a strong character as a musician in the community. Family and friends of nine-year-old cello student Ilan Hurtado, who tragically died in an automobile accident last year, established the scholarship in his memory in the hope that his exemplary spirit and love of music would live on through other young musicians. Angela Lee is a member of New Trier High School's Chamber and Symphony Orchestras, serving as the principal cellist in the former and the associate principal in the latter. The Illinois Music Education Association selected her for the District Senior Orchestra and All-State Orchestra in 2015. She also often forms chamber groups with her peers to perform at various events. Mark your calendars! On Monday, November 9th, Philharmonia and KDFC present PBO SESSIONS: The Royal Brandenburgs at the ODC Theater, San Francisco. Acclaimed conductor and harpsichordist from the Academy of Ancient Music, Richard Egarr, will perform with Philharmonia and share insights on the ever-popular Brandenburg Concertos by J.S. Bach. PBO SESSIONS is a complete classical music experience with dialogue, multimedia presentation and exquisite performances. It all takes place in the intimate brick-walled ODC Theater, in San Francisco's Mission District. After the concert, stick around and join Richard and the musicians for conversation and free wine in the lobby. The Brandenburg Concertos are Bach's most popular examples of instrumental music. But did you know that the Royal Margrave to whom they were dedicated never heard them performed in his own lifetime? It was only 100 years later that these pieces were rediscovered, and begun to be recognized as the finest orchestral music of the Baroque period. a major U.S. fall tour. The Chucho Valdés: Irakere 40 tour is a celebration of Irakere, the Cuban band that, with its bold fusion of Afro-Cuban ritual and popular musics, jazz and rock, marked a before and after in Latin jazz. But this 2015 tour also plays as a summing up of the extraordinary contributions of five-time Grammy and three-time Latin Grammy-winning pianist, composer and bandleader Jesús "Chucho" Valdés, Irakere's founder, main composer and arranger. In conjunction with the U.S. tour, Chucho Valdés will release Tribute to Irakere [Live at Marciac] (Jazz Village) on October 20th. Jazz Village released Valdés´s Grammy-nominated Border-Free in 2013 featuring his current group, The Afro-Cuban Messengers. The young Messengers grew up in Cuba listening to the music of Irakere — something that became a defining element for this project. Concert length is approximately 90 minutes without intermission. Program may be subject to change. A special collaboration between New York-Presbyterian Weill Cornell Medical Center's Heart Institute and One World Symphony! On Sunday, October 25, 2015, staff from New York-Presbyterian Weill Cornell Medical Center's Heart Institute will be at the world premiere of Hannibal (2015) teaching HandsOnly CPR - a technique that could be a potentially life-saving difference for someone who is suffering a sudden cardiac arrest. The inspiration for the unique community collaboration was begun when Sung Jin Hong researched and decided to include actual heart rhythms and murmurs (including "pathological") in Hannibal (2015). His research was confirmed by cardiologist Dr. Steven Markowitz at New York-Presbyterian. Their stimulating dialogue and discussions led them to present a community event that could save lives. Sony Classical is proud to announce an exclusive long-term agreement with Pretty Yende, the sensational young South African soprano whose career has risen to the top of the opera world with unparalleled speed within the past few years. She has already been engaged by every major opera house in the world and after her debut recital in London, The Telegraph commented, "Possessed of diamanté tone and a megawatt smile... a soprano of real musical intelligence." The New York Times wrote, "Her voice has a luminous sheen combined with steely resolve... she delivered some of the most difficult coloratura passages with scintillating precision." In 2013, she stepped in at a month's notice to sing in Rossini's Le comte Ory opposite Juan Diego Flórez at New York's Metropolitan Opera to rapturous acclaim. Later that year, she also replaced an indisposed Cecilia Bartoli at Vienna's Theater an der Wien in the same opera. Born in 1985 in the small town of Piet Retief, about two hundred miles from Johannesburg, Yende's journey to become one of the world's most sought-after singers is like a modern fairy-tale. She was initially introduced to singing in a manner familiar to many South Africans - in her church choir. Then at the age of sixteen, she heard the "Flower Duet" from Lakmé on a British Airways television advertisement, and was so enraptured by its beauty that she determined to find out what it was. On learning that it was opera, she decided at that moment to abandon her plans to become an accountant, and train to become an opera singer instead. She started her vocal studies at South African College of Music (SACM UCT) with Virginia Davids and developed her musical and stage experience with Angelo Gobato and Kemal Khan of the Colleges' Opera school. Yende's extraordinary talent blossomed, and in 2009 she became the first singer to win first prize in every category in the Belvedere Singing Competition in Vienna. This led to an offer to join the prestigious young artists' programme at La Scala in Milan. In 2011, she then won first prize in Plácido Domingo's Operalia competition in Moscow, also winning the prizes of the Public and the Zarzuela prize, the first singer in history to win all three prizes. Yende's debut album on Sony Classical, scheduled for autumn 2016, will celebrate some of the milestones of her extraordinary musical journey. In addition to the much-loved Lakmé duet which first opened her heart to the world of opera, there will be arias from Le comte Ory in which she shot to international attention at the Met. She will also perform arias from other roles in which she continues to dazzle audiences and critics: Lucia (Lucia di Lammermoor), Rosina (Il barbiere di Siviglia), and Elvira (I puritani). She will perform the latter opera at Zurich opera in June 2016. 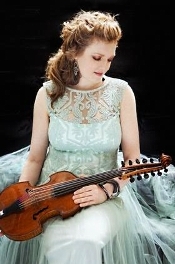 Curious Flights Postpones November 11 "Recital Masters"
Curious Flights concert series are postponing the November 11 performance "Recital Masters" with British violinist Madeleine Mitchell due to unforeseen circumstances. Ms. Mitchell was due to appear in recital at the Century Club of California as part of her tour of the United States, with a Veteran's Day program of works by American and British war era composers. Curious Flights looks forward to working with Ms. Mitchell to bring her back to San Francisco at a later date. Curious Flights recently kicked off its second full season on August 29 with a program of chamber works by English composers and continues on March 19, 2016 with a showcase of contemporary works by local Bay Area composers and a residency by two-time British Composer Award winner Simon Dobson. The San Francisco Wind Ensemble will present two world premiere commissions by Bay Area composers Noah Luna and Bobby Chastain in addition to a U.S. premiere by Simon Dobson. A further world premiere commission for clarinet and electronics by Dobson features alongside chamber works by Samuel Adams and Mason Bates. The season concludes on May 28, 2016 with the West Coast Premiere of Marc Blitzstein's The Airborne Symphony led by Marin Symphony Music Director Alasdair Neale. This monumental work for large orchestra, men's chorus, solo voices and narrator will be performed by the Curious Flights Symphony Orchestra, Curious Flights Festival Chorus and soloists Brian Thorsett (tenor) and Efrain Solis (baritone). Focusing on the untold contributions of American composers to both the war effort and the general promotion of American music during this era, the program will also include Copland's Sextet for clarinet, piano and string quartet, Barber's Stopwatch and an Ordance Map and an arrangement of music from Korngold's film score to the Constant Nymph. Tod Machover has been named 2016 Composer of the Year by Musical America, the prestigious classical music publication. Joining the ranks of composers who have received this illustrious honor, such as John Luther Adams, Meredith Monk, Arvo Pärt, George Crumb, Steve Reich, Stephen Sondheim, John Adams, and Milton Babbitt, Machover states, "I am very grateful to Musical America for this honor and am thrilled to join a tradition that includes so many composers whose musical imagination and impact I admire." Carnegie Hall will host the annual Musical America Awards on December 8, where Machover is joined by Artist of the Year Yannick Nezet-Seguin, Instrumentalist of the Year Jennifer Koh, Vocalist of the Year Mark Padmore, and Ensemble of the Year BMOP (Boston Modern Orchestra Project). Read the article HERE. Called "visionary" by the New York Times, Machover will premiere the fifth of his collaborative City Symphony Series - the first in the U.S.- in Detroit in November. Commissioned and performed by the Detroit Symphony Orchestra, led by Leonard Slatkin, Symphony in D integrates music, sounds of the city, new technology, and the creative participation of numerous citizens of Detroit, of all backgrounds and ages. Machover premiered A Symphony for Lucerne to great critical and public acclaim last month at the Lucerne Festival, where he was this year's Composer-In-Residence. Machover is the inventor of Hyperinstruments and is known for pushing the boundaries of technology, live performance and the audience experience. He is the composer of many groundbreaking operas including VALIS, the Brain Opera, Resurrection, and the robotic Death and the Powers that was a finalist for the 2012 Pulitzer Prize. Machover is the Muriel L. Cooper Professor of Music and Media at the MIT Media Lab and Director of its Opera of the Future Group. He studied with Elliott Carter at The Juilliard School and was the first Director of Musical Research at Pierre Boulez's IRCAM in Paris. Young People's Chorus of NYC has done it again! YPC and Francisco Núñez returned from Munich, Germany, on Monday, October 12, where they were hosted by BR Klassik, with a first-place win in the Children and Youth Category after a flawless performance in the 2015 European Broadcasting Network's Let the Peoples Sing competition, among the most prestigious choral competitions in all of Europe. YPC is the first American chorus ever to place first in the competition's 54-year history. After Sunday's competition performances among YPC, the Aarhus Girls' Chorus from Denmark and the Romanian Radio Children's Choir, the judges named the Danish choir the winner. However, on Monday morning, the judges rethought their initial decision and determined that the American chorus should tie with the Danish choir for first place in the Children's and Youth category. Francisco and the choristers received the news while 35,000 feet above the Atlantic Ocean on their return flight to New York. Tears and cheers ensued! Music by Cimarosa, Molique, and Moscheles. Mathieu Dufour, flute; Alex Klein, Oboe; Paul Freeman, Czech National Symphony Orchestra. Cedille Records CDR 90000 080. Three highlights of this 2004 Cedille release are (1) the enthusiastic playing of the Czech National Symphony Orchestra, under the direction of its Music Director and Chief Conductor at the time, the late American conductor Paul Freeman (1936-2015), and his two soloists, Mathieu Dufour and Alex Klein; (2) the fascinating combination of pieces for wind solos and ensembles that Cedille include; and (3) the excellence of the Cedille recording. The booklet note says that this is the eighth Cedille recording with Freeman and the Czech orchestra, and one can understand why the conductor appears to like them so much. They play with a genuine flair and affection for the music. 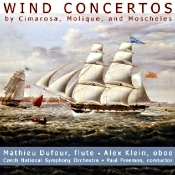 Said music would be a late Classical era Concerto for 2 flutes & orchestra by Domenico Cimarosa (1749-1801), here played on flute and oboe; two early Romantic concertos by Wilhelm Bernhard Molique (1802-1869), one for flute solo and one for oboe solo; and an early Romantic period Concerto for Flute and Oboe by Ignaz Moscheles (1794-1870). Just listening to the Classical work next to the Romantic works is a lesson in music history in itself, the orchestra opening up, expanding in the latter pieces, becoming not only bigger with added instruments but warmer, the music less formal this way and more smoothly flowing. I'm not suggesting one is better than the other, incidentally, just different. The accompanying booklet note is more informative than most, and Cedille's choice of a cover painting is quite attractive. Sometimes, it's the little touches that add to one's enjoyment of an album. Cedille Record's Bill Maylone, one of my favorite audio engineers, recorded the four pieces, and Cedille released the album in 2004. Maylone manages to capture the Classical work with a wonderful clarity, while also capturing all the warmth and charm of the Romantic pieces without losing much of that initial lucidity. The sound is natural, lifelike, vibrant, perhaps a tad bass shy (although the pieces don't require much bass), enveloping, and refreshingly entertaining. Also, Faure: Elgie for Cello and Orchestra. 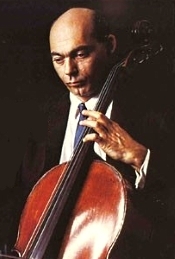 Janos Starker, cello; Walter Susskind, Philharmonia Orchestra. Hi-Q Records HQXRCD45. 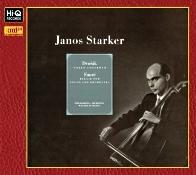 Hungarian-born American cellist Janos Starker (1924-2013) made the Dvorak Cello Concerto something of a signature piece. It's understandable as it was the work he played when he made his concert debut at the age of fourteen. His 1956 performance offered here in an audiophile remaster from Hi-Q Records has the distinction of being among the first-ever stereo recordings of the music. Starker would record the piece several times, including a 1962 performance with Antal Dorati on the Mercury label. Of the two, I favor the latter one, particularly for its sound, although now that Hi-Q has made this earlier recording available remastered, it becomes more of a toss-up. Certainly, Starker takes a masculine approach to the work in any case, a tack that works well in the outer movements, if not especially well in the second-movement Adagio. Still, it's an interpretation worth investigating. Czech composer Antonin Dvorak (1841-1904) wrote the Cello Concerto in B minor, Op. 104 relatively late in his career, 1895, and it has since become one of the most-popular cello concertos in the field. One can hardly discount its late-Romantic qualities, its copious melodies, and its lusty emotions. The concerto begins with a long, imposing orchestral introduction before the cello enters, an intro that alludes to both of the work's two upcoming themes, and Maestro Walter Susskind and the Philharmonia Orchestra in its prime manage this preliminatry music as well as anyone. Then when Starker's cello joins the proceedings, he pretty much takes over. As I said earlier, Starker follows a fairly muscular, aggressive course in the opening movement. In his later Mercury recording, he seemed a little more relaxed, a little less intense, and some listeners may prefer this. His is a highly Romantic vision of the music, to be sure, yet perhaps filtered through a more twentieth-century sensibility. After the strong start is the Adagio I mentioned, which should glide sweetly along like a slow-moving stream, wistfully, with a touch of sadness. Maybe it was the illness and eventual death of Dvorak's sister-in-law, with whom he had once been in love, that inspired some of the movement's melancholy, I don't know. Whatever, it's here that Starker seems a bit too perfunctory to me, as though he just wants to get the movement over with to get on with the thrills of the finale. So, in other words, the music loses a bit of something in terms of sheer poetry. Nevertheless, he makes up for it with a passionately dramatic middle section of the movement. Then we get the finale, seething with energy and concluding with another touch of melancholy in a climactic love duet before the work's heroic close. Starker and Susskind take a strict view of this last movement, with absolutely no softening or glamorizing of the melodies and a rigid execution of the marchlike rhythms. It may be a tad too stern for some ears, or it may be just right for others. I guess over the years Starker's exacting musical interpretations have grown on me, so it sounds fine to my ears. Coupled with the concerto is Elegie by French composer Gabriel Faure (1845-1924). Faure may have written this sorrowful lament for a lost love; at least that's the contention. Originally the composer wrote it for cello and piano, but later arranged the orchestral accompaniment we find here. It's certainly a passionate affair, filled with an anguished sadness, and apparently that's how Starker sees it, too. It's a brief piece, hardly over five minutes, yet Starker brings out its longings in a reasonably heartfelt fashion, the cello crying in pain. Still, there is something in Starker's handling of it that seems perhaps too demanding, too calculated, as though he can't quite let his emotions flow entirely freely. But I quibble. It's a lovely work and lovely performance. As always, the folks at Hi-Q package the disc in a glossy, hardcover, foldout Digipak-type case, the disc fasten to the inside back cover and text notes to the inside. Producer Walter Legge and engineers Robert Gooch and Michael Grafton-Green recorded both works at Kingsway Hall, London in July 1956. Tohru Kotetsu remastered the recording at the JVC Mastering Center, Japan, using XRCD24 technology, and Hi-Q Records released the disc in September 2015. The sound is remarkable for its age; indeed, it's remarkable for any age. It's very clean, extremely clear, highly dynamic, and well extended in both bass and treble, the hall adding a sweet and lifelike decay time. The cello appears well represented; quite natural in tone if a bit forward in its perspective; and the orchestra comes across in a realistic width and depth, with plenty of air around the instruments. Is everything, therefore, perfect? Not quite. A couple of minor qualms involve a few extraneous bass clunks toward the beginning (no idea what they were but I replayed them several times just to be sure it wasn't something outside my playback system); a slightly hard upper midrange; and a touch of background noise noticeable when played loudly. These are quibbles are hardly worth mentioning, though, given that the bulk of the sound is as good as or better than most recordings you'll hear today.